Located in Pocheon, Gyeonggi-do, Bears Town Resort is a great place for a one-day ski or snowboard trip since it's only about 50 minutes away from Seoul. The resort offers a slope exclusively for expert skiers, two slopes for advanced skiers, two slopes for advanced/intermediate skiers, and three slopes for beginners. All slopes are open for snowboarding and there are 8 lifts, including one express lift. The resort is a popular family destination because of its long sledding hill measuring 400 meters in length. 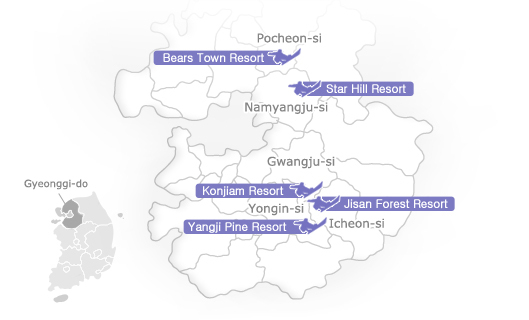 Located in Namyangju-si, Gyeonggi-do, Star Hill Resort is 32 km away from Seoul (City Hall), making it possible for visitors to enjoy a full day of skiing without having to stay overnight. Each of the six slopes has its own exclusive lift, drastically cutting down wait times. This small, cozy resort nestled in the foothills outside Seoul has well-developed facilities and a convenient location that has made it increasingly popular among visitors from Seoul and the nearby metro areas. Located in Icheon-si City, Gyeonggi-do, Jisan Forest Resort is only 40 minutes away from Gangnam to the south of Seoul, meaning that even when accommodations are booked, visitors can make a daytrip out to this beautiful ski resort. There are seven main ski slopes and 3 sub-slopes, all of which are open to both skiers and snowboarders. Thanks to the 5 high-speed lifts, there is no waiting in line, and there is even an escalator for children and beginners. The lifts are equipped with heated seats for a warm, comfortable ride. Even though this particular resort is on the smaller side, it is packed with convenient facilities at inexpensive prices. The resort is a great value for the price and gives its visitors an affordable winter sports experience without sacrificing quality. Located in Yongin, Gyeonggi-do, the Yangji Pine Resort Ski Valley offers a sledding hill, 6 ski lifts, and 10 slopes for various skill levels. Night skiing is very popular at Yangji Pine Resort and the well-lit slopes give visitors a nighttime ski experience that is as safe as it is thrilling. The Snow Park for snowboarders is equipped with various obstacles. The resort also offers a mogul ski course for experts and thrill seekers as well as ski and snowboard lessons. 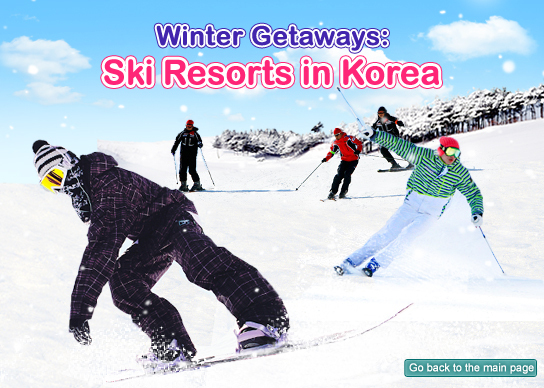 Located in Gwangju, Gyeonggi-do, Konjiam Resort is the largest ski resort in the Seoul vicinity and limits its number of daily skiers (maximum: 7,000 skiers per day). The resort has a total of 11 slopes (beginner, intermediate, advanced, and expert) and even has an arboretum, ecological river, and a spa. Accommodations can be found around the tourist attractions, city hall or the county office. Gyeonggi-do Province has a diverse landscape of ocean, mountains, and plains giving variety to the food in the region. Local dishes usually have a simple taste like ones in Gangwon-do province. You can try local food at restaurants downtown and near tourist attractions.